No fees. $10,000 maximum withdrawal per card per month, 10 transactions per card per month, 1 card per account. RBinary is no longer operating as a binary options broker. The review presented below is no longer applicable and is presented for archive purpose only. 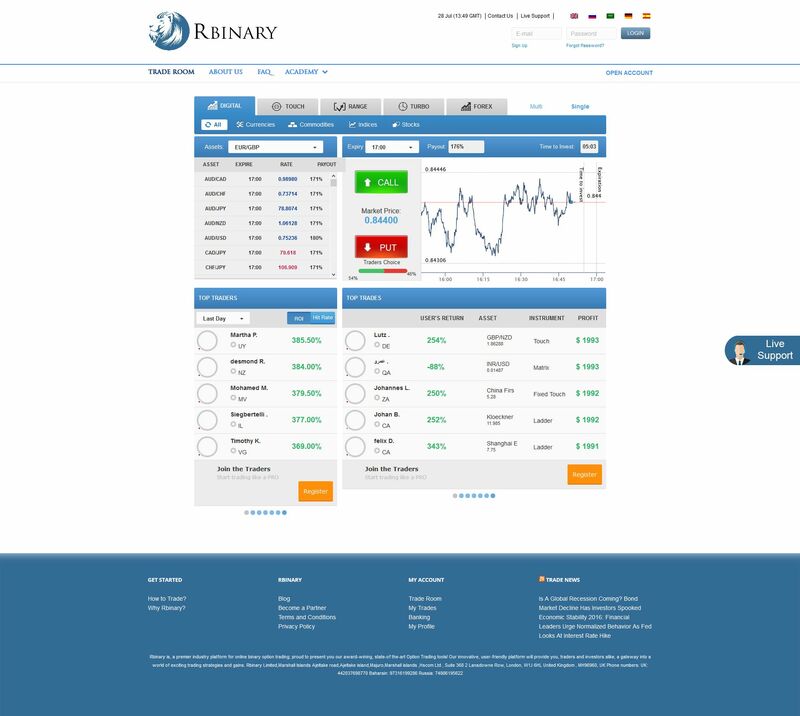 RBinary is a broker based in Anguilla which offers trading accounts to customers around the world. Even though they are not regulated, they unfortunately do not accept traders from the USA. They have some great features like a demo account and a unique money-back guarantee which set them apart from the crowd. Let’s take a look. RBinary provides fairly sparse information about depositing, but we can assume that they accept the standard payment methods which are popular for binary options brokers: credit and debit card and wire transfer. You can open an account in US Dollar, Euro, British Pound, Saudi Riyal, or Kuwaiti Dinar, suggesting that the company caters its services especially toward customers in the Middle East. Standard: Deposit $250 or more, get a 10% bonus. Silver: Deposit $1,000 or more, get a 20% bonus. Gold: Deposit $5,000 or more, get a 30% bonus. Platinum: Deposit $20,000 or more, get a 50% bonus. VIP: Deposit $50,000 or more, get a 100% bonus. You also have the option of chatting with a customer service agent about opening a demo account which you can use to trade without investing real money! This is an excellent feature you can use to learn the ropes on the platform and also test your strategies. On that note, it is interesting to me that RBinary links out to MetaTrader4. 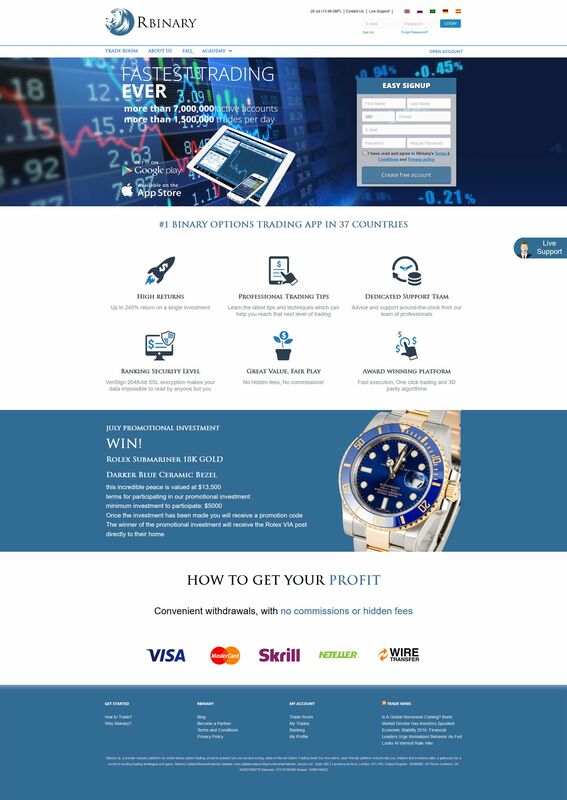 MT4 is an amazing free charting platform I highly recommend to all binary options traders! It is very rare however that I see a broker that recommends it too. This is yet another way in which this company is encouraging traders to do their testing instead of trading blindly. At the Standard account level, you get personal support, a binary options guide, and 17 video lessons. With each level, more video tutorials are added, along with additional features such as feedback on your trading direct from the company, special strategies, and at the VIP level, signals. You also get extra revenue back on your trades at the Silver, Gold, Platinum, and VIP levels, starting at 1% and ranging as high as 5% at the top tier. One matter which initially gave me pause concerned minimum trade amounts, which are determined by your account size. At the Standard level, you must trade at least $10 or the equivalent in your currency. At the Gold level, it goes up to $25, and then jumps at the Platinum and VIP levels to $50. This may make you feel wary, but if you crunch the numbers, it really is no big deal. You’d be wagering less than 1% of your account in any case at the minimum level, so these are reasonable requirements that should not disrupt your money management plan, even if you are trading conservatively. Another nice thing about RBinary is that they do not impose fees on your withdrawals, nor did I find any mention of a minimum threshold. There is a $10,000 maximum withdrawal per card per month, and a max of ten transactions per card per month. For most traders, this will not be terribly restrictive. You can only have one card per month, but no restrictions are mentioned regarding wire transfers. I have never seen a refund policy like this on a binary options site, so this is a unique advantage. It is also very comforting to hear a company reassure you that your money is your money! You do not need to worry about your funds getting locked up and becoming inaccessible to you. This is a common problem at many other websites, and one of the main reasons I always pay such close attention to withdrawal terms when I am perusing these sites (and so should you). RBinary runs on the Tradologic platform. This is not as popular as SpotOption, but the look, feel, and operation is basically the same, so learning how to use it is quite easy. There are 246 assets available, which is just an astounding number, including way more commodities than I have seen on any other site to date. Types of options include High/Low, One Touch, Range, Turbo, and Forex. Also cool is the fact that you can get profits up to 180% on High/Low. This is an astonishingly high payout on this type of option! On most sites you will find payouts closer to 80%. So far I have spoken glowingly of RBinary. Any drawbacks you should be aware of? While on the whole I am impressed with this company, there is that “unfinished” sense to the site itself—the same that you find at most brokers. They could polish up their pages and their articles. Anything else? Customer service was absent when I checked on a weekday during standard market hours. The live chat desk absolutely needs to be staffed. There really are very few negatives which I can identify with this website. RBinary has a lot of impressive features: you can demo test before you trade live, there are no fees or minimums on withdrawals, and the company promises that you can access and withdraw your complete funds at any time if you wish. There are a lot of video tutorials, the company offers signals, and there are plenty of other extra tools and educational benefits. If you are searching for a company that features transparency and offers you some great advantages, RBinary appears to be well worth a closer look. Bottom line is, I reported them to eConsumer.com and ActionFraud.Police.uk. There are a couple trades still pending, but I don’t trust them anymore and I think they will just trade it to 0 in case any of those trades accidentally end up in the money. I demanded that they return my investment of 28k, but so far I haven’t received anything. Now a couple of those trades ended up in the money, so I had 113k on my account again. But they again traded it without my permission and the account balance is now 76k. I tried several times to withdraw, but they simply delete the withdrawal request, without any explanation. They dont answer any emails and now even the live chat on my account doesn’t work anymore. And on top of that, they just deleted 2 trades (each for 10.000 eur) that would expire on 31st of December). Those trades are simply not there anymore. avoid them, they are scammers!! I to had the same bad experiences as Andrej and Romuald . They trade without your permission. I to had deleted a trade 0f 10K U.S. that would expire on December 31st. this trade was no longer in my account. I have several trades that will expire on March 30, 2017 in the amount of 155K U.S.the account is nowhere to be found. Nor doses the website , email work anymore. Avoid them they will scam you.